Today you may need to think about your own limitations, and how you’ve contributed to the obstacles that stand between you and your goals. You may feel like you’re beating your head against a wall or like all of your efforts are being met with resistance. You may question whether the Universe is telling you to fight or to accept defeat — although neither of these is going to be the right course of action. If you look at the demon in the card you can see that he has several ways out. The Swords that are lined up behind him are more decoration than anything else. The chain around his leg is attached to … nothing. And he has wings! If he wanted to he could just take flight. There are multiple options available to him to break free. Mars moves into Libra today and brings with it many opportunities to start something new. Are you thinking of launching a new business or starting a new financial venture? Mars relates to action and energy and while its placement in Libra can have you struggling with decisions about what exactly you want to do in the first place, it does mark the onset of a new cycle. 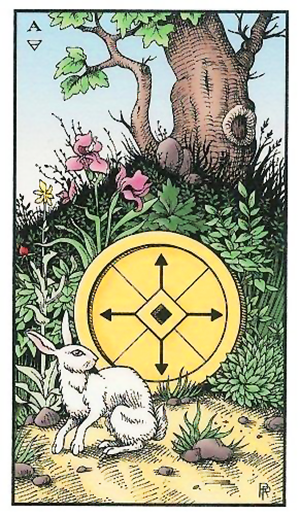 You may be looking back over your shoulder though, like the rabbit in this card — from the gorgeous Alchemical Tarot. The Coin in this deck is fashioned like a compass with four arrows pointing in different directions. This ties in with the Mars in Libra conundrum. Which way do you go? Which path do you take? There are many different options and you may be drawn to every one. The Ace of Coins is says it’s time to think about what you value, which extends to well beyond money and material things. It says it’s time to look at what you put out there and what you get back in exchange. Like the rabbit looking over his shoulder, you may have to clear up some unfinished business, but there’s no time like the present for that. The Ace of Coins encourages you to participate in your own energetic exchange. Whether it’s time, money, energy or aid, all of us have resources at our disposal. Put yours to good use this today and see what the Universe sends back. There is a taste of fate in the air today as the Sun conjuncts the north node. It may be time for you to sit back and put all your well laid plans into action and if you need help ask for it. You have the ability and strength to get anything done and you may find you don’t even know yourself as you begin the tasks that need doing. The dragon in this image implies a mythical creature. It also implies you will brook no interference and heaven help anyone who crosses you today. I’m not saying they don’t deserve your wrath as you are on a mission and this seems to be the day you will use to do what needs doing. You have an eye out for trouble and at the same time are guarding that which is yours. If you have been worried that someone is possibly going to steal one of your ideas or that you need to secure that which you own then take the steps necessary to do so. You might also wish to think about what the word “fate” means to you. Does it mean you just blindly go along in your life and take what life deals out to you or does it mean you have a say in your life and can use your will power to manipulate an outcome. 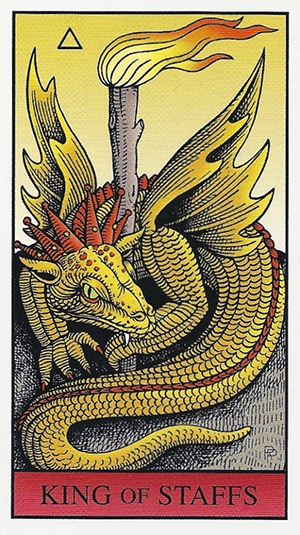 The Sun conjunct the north node today will bring these thoughts into your mind… fate versus free will and from the image of this dragon I don’t see you taking anything you don’t like or want laying down. Today’s card — from the Alchemical Tarot — is one of the best modern versions of the Wheel of Fortune that I’ve seen. It’s so rich in symbolism and yet so simplistic, with the “wheel” made of two dragons, each swallowing the other’s tail. Like the mythical Ouroboros or world serpent (and this version also reminded me of the M.C. Escher’s lithograph “Drawing Hands”), there is no beginning or end, much like the rhythms in our own lives. 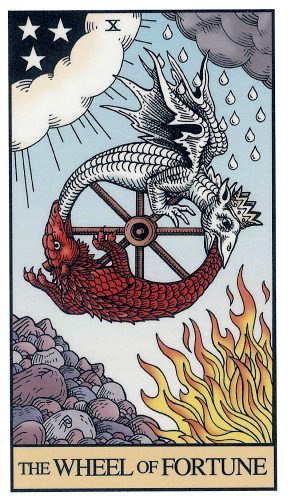 Here we see the two dragons — one white with wings and a crown and the other red, scaly and looking a bit more sinister — circling the wheel together. As one goes up the other comes down, repeating that cycle over and over again in an ongoing (and never ending) process. In the corners of the card are representations of the four cosmogenic elements associated with alchemy, astrology and other timeless traditions. The Wheel just keeps on turning in the middle, reminding us of the ups and downs in our day to day lives. There are elements of karma and fate associated with this card; yet the Wheel of Fortune refers as much to creating your own destiny — and mastering your own fate — as it does to dealing with karmic repercussions. As the Sun conjuncts Jupiter and as Venus trines Neptune today, you may have the impression that your luck is changing for the better. Today’s card — from the Alchemical Tarot — is all about clearing your head and focusing your intentions in order to achieve your goals. The Ace of Swords — as with all Aces — can act as a tool for manifesting. It is raw, pure, unharnessed energy that can be channeled into something both powerful and magical. It can act as a lightning rod for either positive or negative energy, depending on how it’s used. It refers to getting to the heart of the matter, cutting through the BS, speaking your mind and honoring your truth. 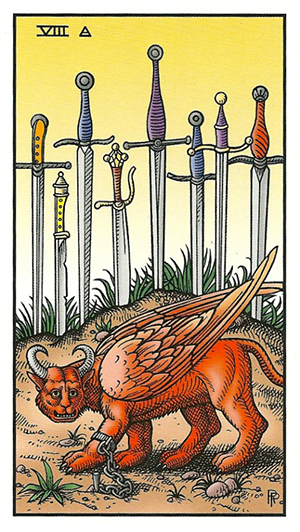 But the Ace of Swords can also be somewhat aggressive and argumentative. When used negatively it really does “cut like a knife” with respect to cruelty or hurtful words. 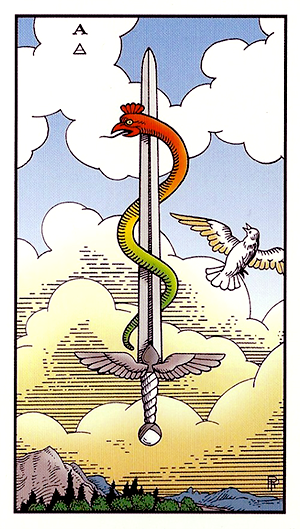 In this version of the card, a rainbow-hued basilisk is entwined around the blade of the Sword, while a white dove flies in the distance. The dove’s wings are repeated on the hilt of the Sword. The juxtaposition of these two disparate forces — the dove representing peace and the basilisk representing a powerful yet destructive alchemical force — reminds us of the need to balance our decisions with forethought and our actions with foresight. 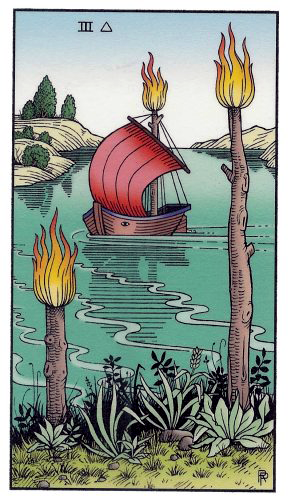 Today’s card — from the Alchemical Tarot — is another Ace. 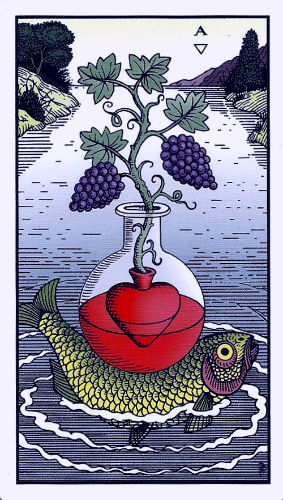 This time though it’s the Ace of Cups (Vessels in this deck), which refers to feelings, emotions, intuition and most importantly “love” in its purest form. This isn’t necessarily a romantic version of love; it has more to do with falling in love with oneself: an alchemical process if ever there was one. When you think about it, it’s this process that reveals to you — at least for a brief moment — all that you are capable of giving and receiving. Aces in general represent raw, unformed energy. The spark of intuition (wands), the seed of an enterprise (pentacles), the origin of an idea (swords). And the most powerful potion of all — love (cups). The imagery in this version of the card is rich with esoteric symbolism. We see a fish carting a precious (and fragile) vessel across a body of water. The vessel contains a heart which is floating in a pool of red (the blood of Christ) and from which sprouts a grape vine (the fruit of life). The fish is said to be a messenger of the unconscious, but also represents wisdom, knowledge and transformation. The vessel — a symbol of mystery, sustenance and fertility, is also an alembic, within which the alchemical process of distilling, refining and transmuting occurs.